← The word of the day. Hooray, it’s February, which means it’s once again time for Thingadailies! In years past I’ve knit dishcloths and crocheted teeny tiny snowflakes, but I was having a hard time coming up with what to do this year. Despite the fact that there are plenty more snowflakes in that book, I wasn’t really feeling the snowflake love for a third year in a row, nor was anything knit jumping out at me. Then my little sister shared an event for Ice Cream for Breakfast for this coming Saturday (why yes, that *is* foreshadowing! ), and curious, I started tracking down why this was apparently a thing, and it turns out there are entire websites devoted to all the weird days of the year, and I started looking through all the National Days for February, and thus, my plan for 2018 was born. Every day for the month of February, I will be making something having to do with whatever that day’s National Day is. 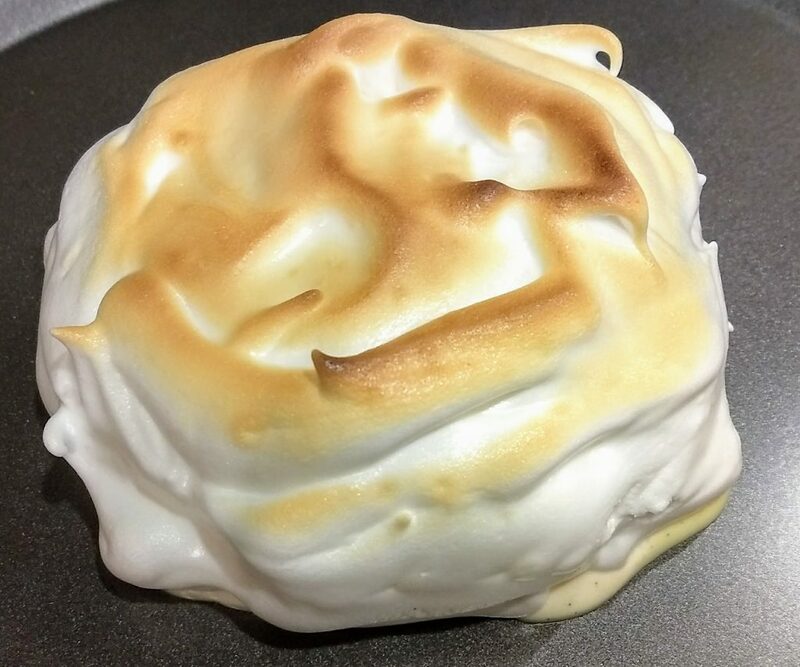 Luckily we’re starting off with something easy, because February 1st is National Baked Alaska Day. This is a dessert that looks complicated but it actually isn’t, because all it requires is cake, ice cream, and some meringue. No sweat! First you start with some cake. Any cake will do, but for the purposes of tonight’s bake, I used this recipe, because there are only two of us and Baked Alaska isn’t really a thing that keeps well, and also last Saturday was National Chocolate Cake Day (go on, Google it, I’ll wait), so technically I made the cake for that, except I put it into two little mini tart pans and saved one of the cakes for today. Then you pick some ice cream and you shape it into an appropriately sized blob. I used vanilla bean, because that pairs well with chocolate. I’m sure there’s some fancy schmancy way to form an ice cream blob to go atop your cake, but I just stuffed another mini tart pan with ice cream this morning and tossed it into the freezer and figured that would work. Finally, you need some egg whites and sugar, which you whip into meringue. This takes several minutes, which means you have plenty of time to chisel the ice cream out of the mini tart pan (pro tip – line your tart pan with plastic wrap before filling it with ice cream, which is a thing I did *not* think to do until after the fact, hence the chiseling part of the equation), but you also have time to then lick all the extra ice cream out of the tart pan once you’ve extracted the vaguely tart-pan-shaped blob and placed it on top of the cake. Next you stuff all the whipped meringue into a piping bag and if you are a trained pastry chef or someone who is actually good at decorating you cover your ice cream-topped cake with a beautiful array of meringue rosettes. Or if you are someone like me, you sort of blob meringue randomly all over the place until it looks like someone melted the head of the Staypuff Marshallow Man on a pan (because you have to make sure the ice cream is completely covered), and then you either torch it (if you happen to have a kitchen torch) or else you stick it under the broiler until the top is golden brown and hopefully not burnt, or until you notice that ice cream is leaking out the bottom and you hastily extract it from the oven before it all dissolves. 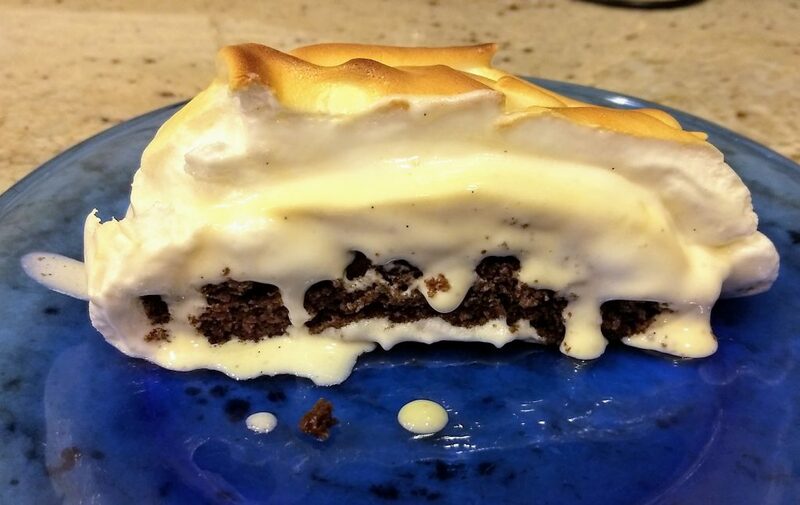 Here is my *beautiful* Baked Alaska. I totally meant for it to look like this. Um. Yeah. You may note the ice cream, leaking out at the bottom there. Oops. This is the cut view. The ice cream was really starting to melt by this point so I’m sure it could be a lot prettier but oh well! Verdict – it might not look like much, but it was quite, quite delicious. The meringue was soft and airy and was not too sweet, which I was admittedly a bit worried it would be. I might actually be tempted to try this again.